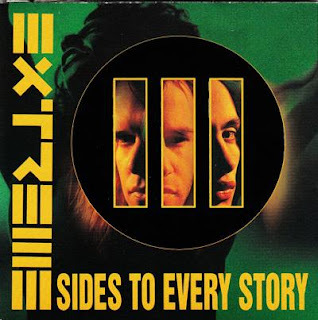 An album of bamboozling ambition, III Sides To Every Story represents the peak of Nuno Bettencourt's creativity. Unfortunately, the over-riding view from that peak is of an overbloated effort that is stunning for just one third and otherwise mostly self-absorbed. Broken down into three chapters labelled "Yours", "Mine" and "The Truth", the first six tracks make up the first side of the story, and collectively they are breathtakingly brilliant. Rarely have six consecutive songs sounded better on any metal album. From Warheads to Peacemaker Die, Bettencourt constructs 33 minutes of complex metal at its most mesmerizing, using his guitar to paint an epic canvass of everything that is wrong with a war-obsessed world. With Paul Geary providing confident support on the drum kit and Gary Cherone respectfully allowing the vocals to play a supporting role, Bettencourt takes centre stage in both creating majestic metal and embellishing it. Warheads is the best of an excellent set, rocketing to a supersonic speed and effortlessly maintaining a breakneck pace. Rest In Peace introduces hypnotic, layered Beatlesque harmonies, Bettencourt never far from leading but allowing rich compositions to breathe on their own when needed. On Color Me Blind and Peacemaker Die, Extreme effectively marry expressive harmonies to uncompromising metal, and deliver a unique, unforgettable sound. Unfortunately, there are two more sides to this story, with eight additional tracks and more than 40 minutes of meandering music. The "Mine" and "The Truth" sets can best be described as pretentious, with Extreme abandoning energy and initiative in favour of orchestration and dreamy acoustics that can only be enjoyed with the right-coloured mushrooms. The content is intriguing as a psychology case study but not necessarily as enjoyable music, and by the time Who Cares drags its obese form over the finish line in an exhausted state, its title captures the prevailing mood of anyone still listening. There may be III Sides To Every Story, but sometimes just one version is all that is worth recounting. Engineered by Bob St. John. Mastered by Bob Ludwig.